Develop feelings of mastery and control. In their role-playing, children are clearly in charge. And the play gives them opportunities to use many of their developing skills: eye-hand coordination, language proficiency, even large motor performance on tricycles or jungle gyms. It provides an opportunity to be inventive, to take risks (social, not physical risks). Learn from their mistakes without mortification or any sense of failure." 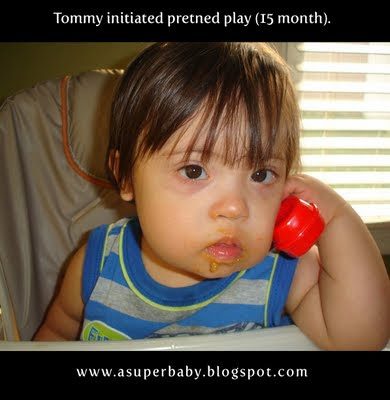 Tommy spontaneously initiated pretend play when he was about 15 month. He started to take anything that looks like glass of water and pretend to drink water. He also initiated pretend play by talking on the phone. Before, he picked his phone toy, put on his ear and started babbling. Now, he loves to dial and call his grandmas from his cell toy. See the video below, Tommy makes a phone call to his grandmas. We are reinforcing his pretend play skills by engaging him in more activities to transform objects and actions symbolically. He has a collectible toy farm from Playmobil. He moves the animals and make the (his) animal sounds, but when he is alone. He stops as soon as he sees me and doesn't do it again. He has also brushed his stuffed animals teeth and hair. We are encourage him to do more this type of actions with his stuffed animals. He also hugs and kisses his monster puppet. 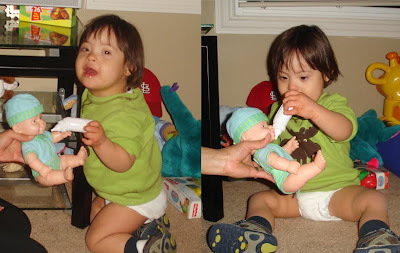 The new pretend play activity is to feed a doll and he is doing an excellent job. As my sister-in-law said: "He is really blossoming and becoming such a little man, not a baby anymore." I can see it when he pretends play because Tommy's pretend playing skills are age appropiate, we are just exposing him to the proper toys according Tommy's preferences and our therapist's guidance. I am collecting all type of cute containers, plastic jars and bottles, and boxes from our groceries. This is a way to have items to pretend play without spending money. This is a fun way to encourage language development, too. Tommy tries to say "garlic" every time I give him a empty garlic jar. Going to the grocery store is an activity for pretend play I am planning when Tommy gets older because he likes to go to the grocery store with us (he already has a shopping cart). If you know any activity to encourage pretend play, feel free to contact me. I will be more than happy to try it. Matthew loves pretend play. His therapist brings a baby doll sometimes and they pretend to feed it, etc. He also loves to pretend to talk on the phone, whether it be his toy phone or the real cordless phone. I just have to make sure he doesn't accidentally dial anyone's number for real. We also have pretend food and I employ Matthew's various stuffed animals to participate in a picnic with us. Wow, Rosa Maria, I sure wish I knew you when Gabe was little because that was one thing we struggled with: pretend play! Terry and I even participated in a playgroup at the Down Syndrome Research Foundation in Burnaby, BC, Canada, especially aimed at encouraging self-directed play. We were in a group with children who have Ds and all in the same age range as Gabe. The one thing that sticks with me is to let Gabe lead the way and then we mimick him. I think it is wonderful that Tommy is doing these things (so many things!) at a very young age! You and your husband should be so proud for supporting and encouraging this for Tommy!